Hard work pays off if you're the Cougars Elite Cheerleading (CEC) program. CEC PRIDE is ranked #1 in the nation for the Youth 1 Division after winning the U.S. Finals Cheer and Dance competition. 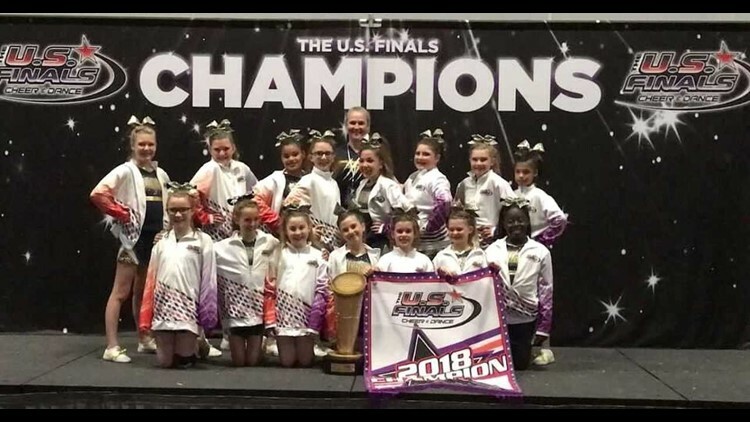 WASHINGTON, D.C. (WUSA9) — The Cougars Elite Cheerleading (CEC) team, a St Mary's County Recreation and Parks sponsored program, just completed their eighth season in glorious fashion. They did the unthinkable... becoming natty champs and therefore the #1 Youth Division Cheer program in the country! Congrats to the whole program! CEC is located in St. Mary's County, MD for individuals 6-18 years of age. The program, originally started in 2008 with multiple competitive squads under St. Mary's County Recreation & Parks, merged squads in the 2010/11 season to allow the opportunity to cheer competitively to individuals all over the county. In addition to cheering and competing, CEC represents R & P during multiple events through the year, and partners with the Carver After School Program every week to spread the SPIRIT of cheerleading to all ages. The CEC program's primary focus is not only to prepare and compete in local, state and national competitions, but to teach athletes self-confidence, athleticism and sportsmanship. During the year, squads concentrate on all components of cheerleading including tumbling, dance, stunting, jumps and showmanship. Coaches have extensive backgrounds in cheerleading and tumbling. What a resume this program has to show-off! Congrats ladies!